WIP #009: VanillaTV – Why not Zoidberg? 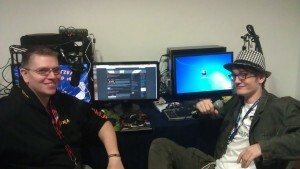 As the Multiplay iSeries LAN i43 draws to a close we catch up with Comedian to find out if it all went as smoothly as he expected. For Comedian and all the crew from VanillaTV.org this had been a harrowing few days. A continuous stream of casting on Friday and Saturday lead on to the dramatic final match on Sunday morning. The sound and computing rigs VanillaTV used were a hodge-podge of tried and tested mixed with borrowed and even gaffer-taped equipment. Possibly the most successful idea Comedian brought to this event was the Cheerfuls. The premise was to simply hand out card and marker pens then ask the crowd to draw a images to cheer their teams on. On the day this unexpected opportunity for crowd participation brought out the cheeky and creative streak in the audience and made the Team Fortress 2 final one of the most fun experiences of the weekend.